Fans of the DC Universe are salivating over the new show, Titans, which is set to stream on DC Universe this year. However, there are some self-proclaimed comic fans who are not pleased with the casting choices. 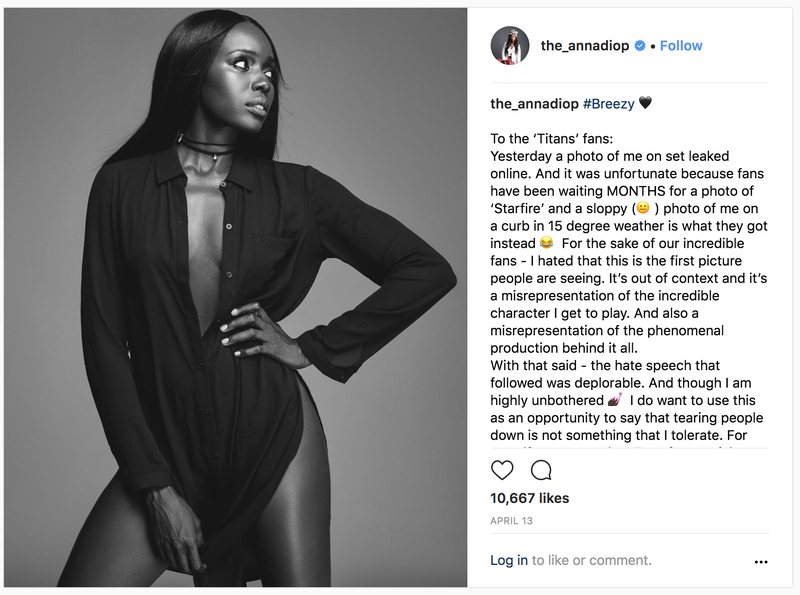 Anna Diop was cast as Starfire, the alien princess from the fictional planet Tamaran. Diop is a black, dark-skinned actress while Starfire is orange with red hair and green eyes. Still, Diop was met with racist backlash after a photo of her in character was leaked online. Many fans took to social media to express their disappointment of a black actress portraying the fictional character. It’s obvious they wanted a black woman to appease the politically correct. Star fire was never black. Others believed that Diop wasn’t attractive enough to play Starfire in general. I also don't care for her skin color I just wish she was cast as a prettier person than Anna diop. Starfire is suppose to be beautiful even if she is a different color. Maybe Anna diop should of been meaghan in later season. Yesterday a photo of me on set leaked online. And it was unfortunate because fans have been waiting MONTHS for a photo of ‘Starfire’ and a sloppy (😐) photo of me on a curb in 15 degree weather is what they got instead 😂 For the sake of our incredible fans – I hated that this is the first picture people are seeing. It’s out of context and it’s a misrepresentation of the incredible character I get to play. And also a misrepresentation of the phenomenal production behind it all. With that said – the hate speech that followed was deplorable. And though I am highly unbothered 💅🏿 I do want to use this as an opportunity to say that tearing people down is not something that I tolerate. For myself or anyone else. Too often social media is abused by some who find refuge in the anonymity and detachment it provides: misused as a tool to harass, abuse, and spew hatred at others. This is weak, sad, and a direct reflection of the abuser. This is not the first time that fans have criticized the casting of non-white actors and actresses for fictional characters. This past month, black actress Candice Patton, who plays the comic hero Flash’s love interest on the upcoming show, The Flash, received her share of racist backlash because her character, Iris West, is traditionally white in the comic books. Kelly Marie Tran, an Asian actress who plays Rose Tico in the upcoming Star Wars film, Star Wars: The Last Jedi, quit social media after angry fans left hateful comments over her character. Many fans of Diop defended her portrayal of Starfire, commenting that the character was fictional and could be interpreted any way the writers wanted. Others believed the backlash stemmed from Diop being dark-skinned as opposed to being light. Bigoted fans do not like the idea of a dark-skinned actress playing the role of Starfire, because to them Starfire is supposed to be light. But it's okay when light-skinned actresses repeatedly play dark-skinned characters because to these fans light skin is an improvement. Among Diop’s supporters was Minka Kelly, who stars in the show as Dove. Kelly took to social media after fans commented on her own Instagram. Regardless of the backlash, Diop will still portray Starfire. Titans is set to premier near the end of 2018. I am a Senior at Pace University, majoring in Communications and Journalism. I have a knack for storytelling and have been published quite a few times in my school's literary magazine. I am also going to offer my services at the school's newspaper, the Pace Chronicle. After graduation, I hope to have a career in Public Relations, Marketing, Advertising, or anything that involves creative writing. I also have a few story ideas for future books that I would like to publish!